Read these instructions completely before starting your installation or update. To install an Automate Schedule IBM i agent, your IBM i server must be at V6R1 or higher. Log on to Automate Schedule on a Windows system. From the menu, click Server > Downloads to go to the Automate Schedule Downloads page. Click Agent for IBMi (Windows .exe installer) to download the installer. For both installs and updates, after you download the installer on a Windows system, you must upload the install files to the IBMi system. To follow these steps, the IBMi system must have the FTP server enabled. If the IBMi doesn't have FTP enabled, follow the steps at the end of this topic for completing a manual installation. Double-click the IBM i agent installer executable for Windows (setupAutomateScheduleIBMiAgent.exe) that you downloaded in the previous section. Select Run, if necessary. 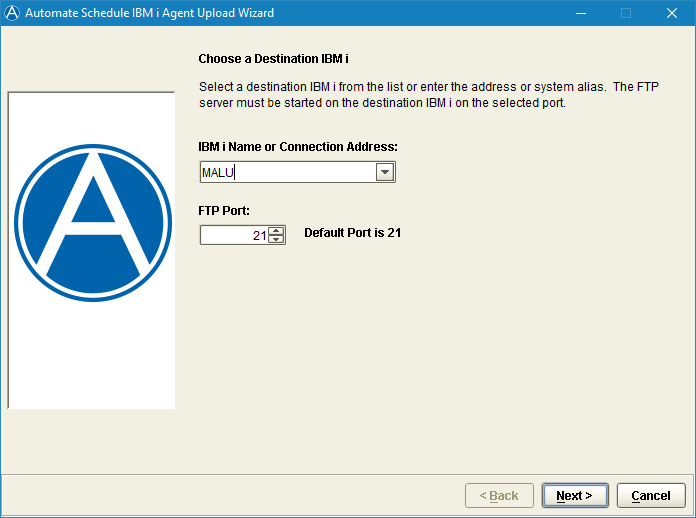 This starts the Automate Schedule IBM i Agent Upload Wizard. Enter the IBM i Name or Connection Address for the IBM i system where you want to install the Automate Schedule agent. Enter the FTP Port number for the IBM i system and click Next. Enter the User Profile and Password for the IBM i system and click Next. Note: The user profile must be a member of the user class *SECOFR and have at least the following special authorities: *ALLOBJ, *SECADM, *JOBCTL, and *IOSYSCFG. The user profile should have Limit capabilities set to *NO. Review the information. If the information is correct, click Start to begin the upload. If the information is incorrect, click Back to change it. You can see the status of the upload on the next panel. When the upload is finished, make note of the commands that are shown in the panel. They're needed to complete the installation (or update) on the IBM i system. Click Finish to close the Wizard. 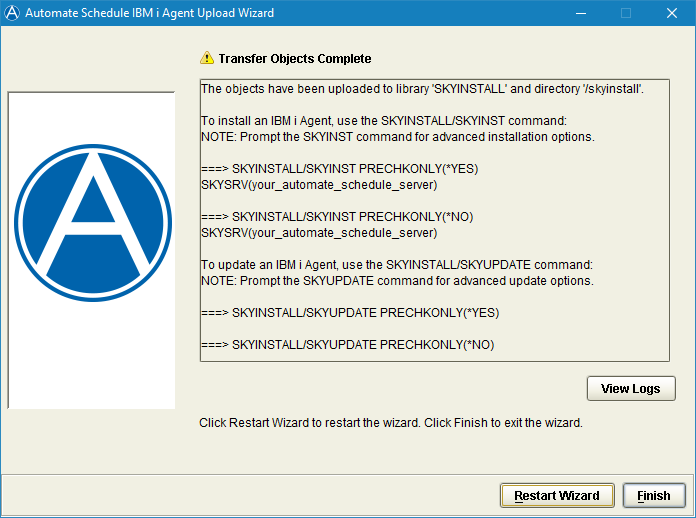 If you need to upload the Automate Schedule agent install files to other IBM i systems, click Restart Wizard. Before installing, you need to know your Automate Schedule server name (Hostname) or IP address. You can find that information by logging on to Automate Schedule. Go to Server > Server Properties. Sign on to the IBM i under a user profile that is a member of the user class *SECOFR and has at least the following special authorities: *ALLOBJ, *SECADM, *JOBCTL, and *IOSYSCFG. The user profile should have Limit capabilities set to *NO. your.server.name is the Hostname or IP address for your Automate Schedule server. portnumber is the port number you assign to the Automate Schedule agent. If your environment did not pass all the pre-check validations, resolve any issues before proceeding. For information on what to do after you have the agent installed, see "Getting Started with Automate Schedule." Installing into a product library other than the default, SKYAGENT. Installing multiple agents on a single IBM i partition (server). Installing into an IASP (ASP group). If you're installing multiple agents on a single IBM i, each agent should be installed with a unique agent port, IFS path, and product library. You must specify a unique product library that is created on the IASP and a corresponding unique system library that is created in *SYSBAS for subsystem definition objects (job queue, job description, class, and subsystem description). You must install the IFS object into a path that includes the ASP device for the IASP. Installing into an ASP Group creates an additional user profile configured for accessing the ASP group from the Automate Schedule Java Processes (JDBC connections). The user profile name will match the system library name that you specified. If you're installing into a secondary IASP in an ASP group, you must specify the specific ASP device and database. Depending on the type of installation you're doing, enter one of the following commands to run the installation pre-checker to verify the install environment. your.server.name is the Hostname or IP address of your Automate Schedule server. yourpath is the path to the IFS object. productlibraryname is the name you assign to the product library. ASPdevicename is the name of the ASP device of the IASP that the agent is being installed into. systemlibraryname is the name you assign to the system library for this ASP group. Sign on to the IBM i under a user profile that is a member of the user class *SECOFR and has at least the following special authorities: *ALLOBJ, *SECADM, *JOBCTL, and *IOSYSCFG. The user profile should have Limit capabilities set to *NO..
ASPdevicename is the name of the ASP device of the IASP that the agent was installed into. productlibraryname is the name you assigned to the product library. Press F3 to exit Qshell. where yymmdd represents the date the update ran. The Automate Schedule agent process runs as jobs in the Automate Schedule subsystem (SKYAGENT by default). You can start and stop the agent process with the SKYSTART and SKYSTOP commands in the product library (SKYAGENT by default). Run the command, WRKACTJOB SBS(SKYAGENT), to view the Automate Schedule subsystem. The image below shows an example of an Automate Schedule subsystem when the Automate Schedule IBM i agent is running normally. Limited authority *PGMR user class profile. Owns most of the Automate Schedule objects. Most programs adopt the SKYBOTUSR authority to access Automate Schedule data. *SECOFR user class with high authority. Owns the SKY163 program that submits the user jobs. The SKY163 program adopts the authority of SKYBOTADM to allow it to submit jobs using any configuration in the product. Note: Installing into an ASP group creates an additional user profile that is configured specifically to reference the ASP group. The Automate Schedule agent process runs as that user profile. That user profile references the SKYBOTUSR user profile as a group profile to have authority to access the Automate Schedule objects. After reducing the SKYBOTADM authority, you will need to provide SKYBOTADM with appropriate authority to any/all objects specified by the IBM i agent environments you define in Automate Schedule for running user jobs. Automate Schedule will not be able to submit jobs that reference any objects on the SBMJOB command that SKYBOTADM is not authorized to use. Download the IBM i agent installer executable for Windows (setupAutomateScheduleIBMiAgent.exe) as described above. Open the executable file with a .zip archive utility such as 7-Zip. Save these two files out of the archive. Note: SKYINST.HS is an archive file in the archive. 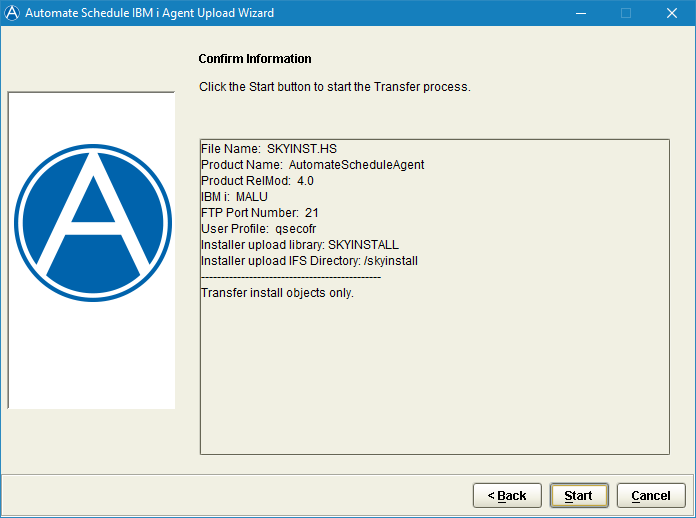 Upload the SKYAGENT file you extracted in step 2 to the SKYINSTALL/SKYAGENT save file. Copy the setupSkybotSchedulerIBMiAgent.jar file you extracted in step 2 to the '/skyinstall' IFS directory. Follow the instructions for installing or updating the Automate Schedule agent (above).